This weekend a friend and I headed to Kiwiana for dinner. I admit I’m not sure what is New Zealand cuisine but I could generalize for the most part that it’s locally and seasonally driven cuisine but it’s primarily British influenced due to British colonization. 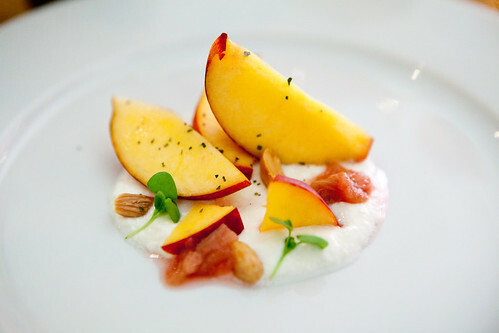 Based on the tasting menu type of format the chef created for us, it’s globally influenced but rooted in comfort American cuisine, seasonal ingredients, and a few New Zealand ingredients that are cooked or served with the dishes. We started with an apértif of a dry, bubbly New Zealand rosé that has lush red berries on the midpoint of the sip. The first course of chilled sweet corn soup with crab, popcorn and chili oil was simply great. 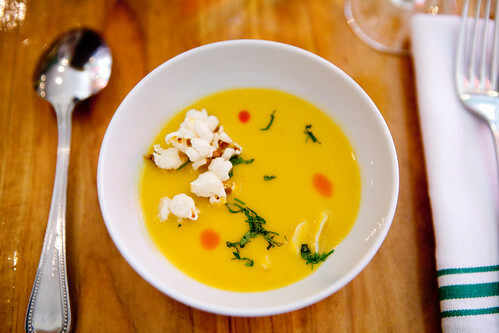 Super sweet, vibrant corn soup that with tendrils of sweet crab meat, salty popcorn for a subtle crunch and a few whiffs of heat from the chili oil. We wouldn’t want to change a thing on this dish. In regards to the rosé wine pairing, it’s not too successful as sweetness of the corn made this wine taste bitter toward the end. 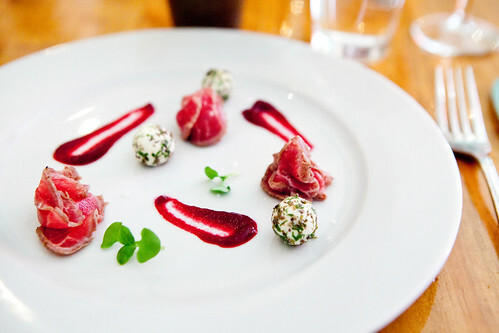 The lamb tataki, smoked beet ketchup, lavender goat cheese was mostly a very good dish, especially the smoked beet ketchup when my friend said, “I need more smoked beet ketchup in my life” and I agree with him completely. That particular condiment was mildly sweet and smoky that worked wonderfully with the delicately seared, paper-thin sliced lamb without overpowering it. Except once the goat cheese is thrown into the mix, we couldn’t taste anything but the creamy cheese. 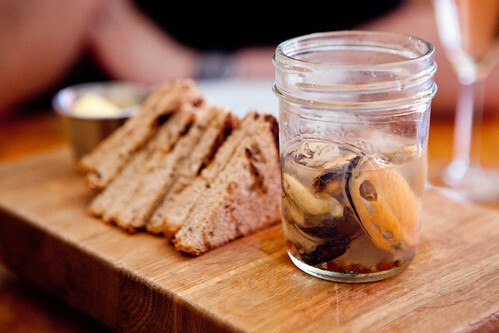 The smoked and pickled green lip mussels with grilled bread and Anchor butter was an interesting course since I never had pickled shellfish before. These meaty, New Zealand originated, bivalves were robustly pickled with a good amount of chili and peppercorns. The smoky, grilled bread and sweet Anchor butter were fine but this dish doesn’t exactly tie together neatly, as it needs something to bridge the two disparate flavors. The larger meat courses were the stronger dishes of the evening. 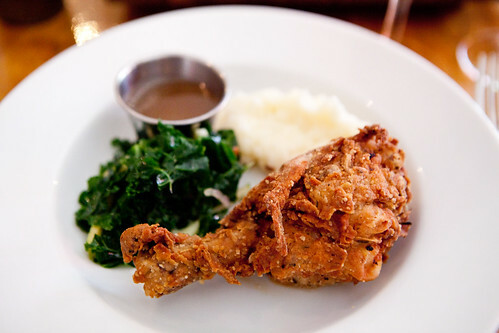 The horopito and buttermilk fried chicken and kale slaw and truffled honey was pretty fantastic. The chicken was juicy, not heavily breaded. The breading was nicely salted and the oregano-like flavored horopito imparted an herbaceous zing that wakens up the palate and make you want to keep biting it. The mashed potato was nicely done and the kale salad was hearty and liked the bright acidic dressing. The chef’s wine pairing of Mt. 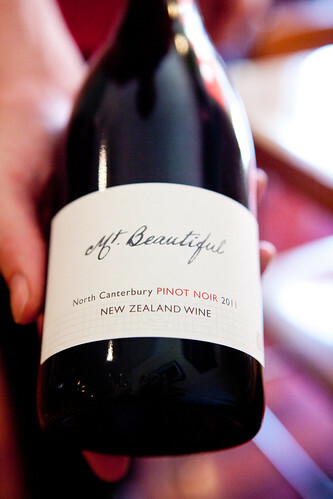 Beautiful, North Canterbury, Pinot Noir 2011 was supposedly chosen for its spiciness. When sipped alone, it’s a thin bodied wine that has a lot of black pepperiness and not much fruit. Trying to have this wine with the chicken, it’s not the best idea since the spiciness from both items cancel each other out. 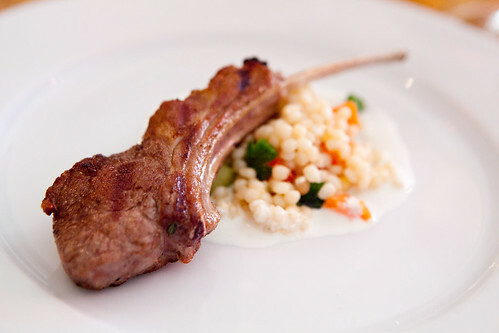 The lamb chop with Israeli couscous, preserved lemon yogurt was generally fine. Our server mistakenly left us with butter knives and we did thought it was unusual but went along with what we have and start eating. The lamb was tender enough to cut with the said knife with not too much effort. (Our server did eventually realize that error and did swap out for steak knives.) If anything, I wish the lamb was charred a bit more. The couscous salad was well cooked and the lemon zing was there but it’s missing something to make this entire dish very good. This dish was paired with that Mt. Beautiful Pinot Noir fared out better here as the lamb is not as spicy and robustly flavored compared to the fried chicken. 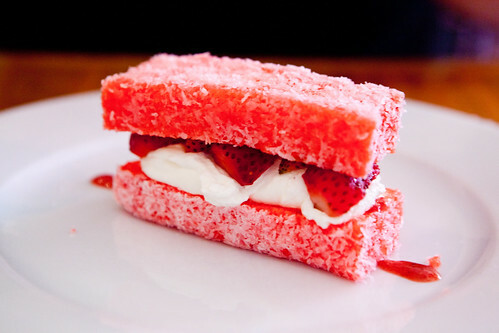 Desserts were New Zealand Pavlova and Lamington, both are arguably created in New Zealand. 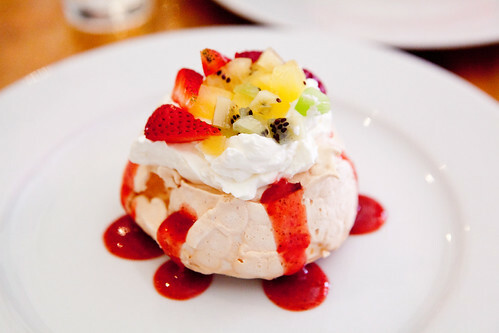 Of the two, I preferred the pavolva since the fruits were riper and sweeter. Meringues are a bit tricky since it’s all about personal preference as to how baked it is (this was cooked through and I prefer somewhere in the middle that has a semi-soft marshmallow meringue middle with a baked crust). The lamington I was envisioning in my head was of the Australian kind (a cube of yellow cake layered in raspberry jam, coated in chocolate frosting and rolled in flaked coconut) – not this bright neon pink cake. Beyond the aesthetics, the cake was moist but the strawberries weren’t as sweet or ripe enough. We did have a New Zealand muscat to pair the desserts and it did work well since the dessert wine wasn’t remotely sweet (thankfully) as the standard muscat style wines I’m familiar with. Overall, this meal was good. The chef’s ambitions probably got the best of him but there were a few stars from what we had like the fried chicken and the corn soup that were absolutely delicious. Order carefully and you’ll enjoy your meal thoroughly here. 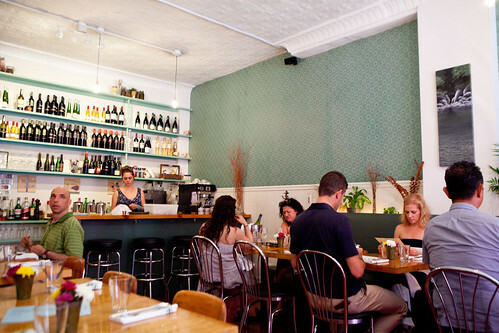 The restaurant feels comfortable and welcoming with the natural light and the servers are friendly. 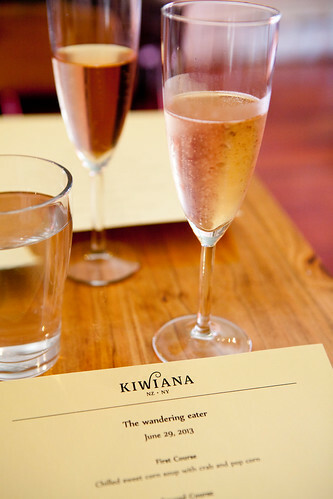 Kiwiana is a restaurant that you should consider to eat in if you’re around the neighborhood.